I found my two male leads for my novel translation of Yun Zhong Ge. I feel kinda giddy I can cast away whomever I want, just cuz I complain and moan each time an adaption casting turns out wonky, and for once I can do something about it in my neck of the woods. With Yang Mi as Yun Ge, I hereby present my loverboy Yuan Hong as Meng Jue and my special guy Roy Qiu as Liu Fu Ling. I can easily switch these two pretties around because with their acting breadth they can do either. But Ling is older than Jue, and I think this works better in my mind. Time is like an arrow, the falling petals are the same every year but the people do not remain the same. When the Winters turn into Summers, the smiling girl of yesteryear has reached her bloom. A brightly lit room, even though it is but one room, it’s already bigger than many combined rooms in other homes. Underneath the floor is heated so even though it is cold outside, the inside feels like a sunny March day. The window panes are lined with green gauze, the decorations inside are precious Han jade, and an urn to the side is filled with South sea pearls. A young girl’s laughter faintly rings out, but despite her voice being present, peering in through the doorway there is no one there. There is only a high shelf completely covered with potted plants. Some are blooming red flowers, others are white ones, and some more are just completely green and falling over the sides of the plant and trailing onto the floor. Another plant is growing along the side of the shelf all the way to the roof, where a red star-shaped flower has bloomed. Many exotic plants are vying for attention in this hothouse, adding warmth and fragrance to the entire room. Walking in, one would think they had accidentally entered a fairy’s residence. Walking deeper inside and past the first flowers, they get an even bigger shock. Inside there was a stove top right in the middle of the nursery. Even if this stove top cut from stone was extraordinarily made, it still shouldn’t be in the middle of this room. But it really is a kitchen, and right now a black-robed girl with her face covered in a gauze veil was cooking. Ah Zhu remained very serious and staring at the knife in her hand. Each piece of vegetable she was chopping was identical in size and shape. Yun Ge didn’t need to look to know that it would be identical to what she demonstrated to Ah Zhu. Thinking about when Ah Zhu would move over to cook the vegetables, her every move would once again be identical to Yun Ge’s, even the time and movement of the hands Ah Zhu would copy exactly so. Yun Ge sighed and shook her head, secretly berating her Third Brother. How the heck did he turn an exceptional swords woman into this controlled state of being? Suddenly a maid came running in “My lady, another guy not afraid of death is here to ask for your hand in marriage.” Yun Ge gave a devious laugh “Come call me to watch the show when my mom tosses him out.” The maid smiled and ran off, but then she didn’t return for some time. Yun Ge started to get worried and said to Ah Zhu “Let me go see what’s happening, I’ll be right back.” Ah Zhu nodded her head, but she wouldn’t know that Yun Ge’s “be right back” will turn into “never coming back.”Ah Zhu waited in the room until it was dark out and still Yun Ge didn’t come back. Using the dark of the night, Yun Ge carried her belongings on her back and flipped over the wall out the courtyard. She turned back to look at the courtyard with some hesitation, but she still took big steps and left. In the breeze there was only the sound of soft laughter. But the young man could see in his father’s still sharp as an eagle’s eyes something that he could’t quite understand. It was like his father was remembering someone. In his heart, his father is someone who won’t even blink an eye if the sky fell down. He can’t imagine a person out there who could put this look on his father’s face. Yun Ge had run away from home for a few days now but she was still feeling upset. She didn’t understand why her normally loving and accommodating to her wishes parents didn’t kick the marriage seeker out on his rear end. Not only did they not kick him out, they were apparently very solicitous of him. Third Brother was even worse. Instead of helping her come up with a plan, he was really annoyed with her. Third Brother was always arrogant when he talked, but that moment it felt like he couldn’t wait to marry her off. Yun Ge had a bellyful of woe she couldn’t find anyone to talk to. She was angry and sad, deciding to run away from home that very night. Since she’s gone, what are they going to do about it? If they want a marriage that badly, they can marry that guy! She was never going to marry him. Everyone thought she had forgotten, her mom and daddy must believe she’s forgotten, but she has not forgotten. She remembered vividly the promise she made. The day when she returned home, her daddy and her mom saw the hair rope around her neck and asked her where it came from. She told them the truth, but who knew her parents face would turn somber. She was so scared she didn’t tell them about the subsequent promise and her giving of her shoe. Mom took away her hair rope and made her promise to never go find Ling gege to play. She cried and refused, and that was the first time her parents didn’t acquiesce to her. In the end her mom couldn’t take her crying and stopped making her promise not to find Ling gege, but she still wouldn’t give her back the hair rope. It’s been so many years that Ling gege’s face is blurry in her mind, but his smile under the starry night continued to remind her, remind her that she made that promise. On the day she learned from a book that a woman giving a man an embroidered shoe meant she was promising to marry him, her heart beat so fast it almost jumped out of her chest. She quickly put the book away like she had done something wrong. He accepted it, which meant he also promised. Yun Ge reminisced about every little moment with Ling gege, her only friend since she was a child. Laying under the stars, she thought about Ling gege in Chang An also looking at the star-filled night. Yun Ge had this weird feeling, knowing for certain that he must also be looking at this sky right now and also quietly remembering their time together. She was anticipating their reunion with happiness. Her lingering worry dissipated and turned into only joy. Laying on the roof, she said to the stars “I remember! The entire sky full of stars as my witness, I would never dare forget.” From that moment on, Yun Ge had a huge secret. When she was alone, she would sometimes secretly smile. Normally she hated being alone and loved company, but suddenly she would run off to be by herself and stare at the night sky. When she heard kids sing folk songs about getting married, she would turn beet red. She stopped wearing any red clothes, because she wanted this color to be worn for a certain person on that certain day. She kept plotting how to go find Ling gege, worried how to make her parents agree to let her go to Chang An. Who knew her parents would suddenly want to marry her off. Since they don’t want her anymore, then she might as well run away and go to Chang An to find Ling gege. But she didn’t have the hair rope anymore, how could she find Ling gege? And when she saw Ling gege, how will she explain? Tell him that his token was confiscated by her mom? ………………. Yun Ge sighed. Forget about this for now, let’s get to Chang An first! She’ll find a way. Traveling East, Yun Ge could only marvel that the Han dynasty is worthy of being called the Sky dynasty. The bustling market towns are more grand than other nations could hope for, with new fun and weird things to see. But Yun Ge grew up seeing treasures and oddities, plus her parents don’t care about owning things. So even the most unique thing Yun Ge would just take a look and move on, to her its nothing important. She only paid attention to the food along the way. If she heard of a delicious item, she would be sure to sample it. Ay! Daddy, mom, even her brothers don’t want her anymore. Why is she even bothering learning new dishes for them? Even though she was grumbling, it’s hard to get rid of her habits from childhood, so Yun Ge continued to run into restaurant after restaurant, and buy spice after spice. Even filled with woe, her face would redden when she would think about not cooking this for Third Brother, but instead cooking it for Ling gege. Because she was so annoyed, she decided to dress like a beggar to travel, for fun and to make her parents suffer. She felt like the more raggedy she looked, it would make her parents feel even worse, and that made her feel slightly better. When Yun Ge left home it was cold and frosty out, but by the time she arrived in Chang An it was already Spring. Arriving right outside Chang An, Yun Ge heard about a restaurant called Qi Li Xiang (Seven Mile Fragrant Loft), and she hurried to check it out, wanting to know how the fragrance could waft for seven miles. Arriving outside the restaurant, she saw it crowded with people already. Her heart lifted, excited to check out something fun! Everyone crowded to watch so Yun Ge was hopping up and down and still she couldn’t see anything over the crowds. Yun Ge saw the eight-deep crowd and smiled, taking out the pungent fish grass from her pouch and squeezing it in her hand. She pushed through and everyone passed for her as they hurried to pinch their noses and move aside. Yun Ge happily got the best spot and no one came to bother her. She tossed a dried sour plum in her mouth and got ready to watch the show. Yun Ge was dressed like a beggar this entire way and endured a lot of nasty derision, so seeing the boy this way and hearing he was all alone, felt sympathetic to him. She was thinking of how to save the boy when the owner of the restaurant came out to beg her to stop since she was blocking business. The girl appeared familiar with the owner, so she gave the boy one more glare before reluctantly letting him go. The girl sold her wine to the owner, counted her money carefully, and then left. Yun Ge’s eyes twirled and then quietly followed the girl. Because no one was paying attention, so no one noticed that when Yun Ge was outside watching this show, up in the second floor of the restaurant, a richly dressed young man was staring at her. When he saw her leave, he immediately left the restaurant and followed behind her. Yun Ge followed the girl and walked for some time before arriving at a small lane. She looked around to make sure the coast was clear and wanted to strike when suddenly someone called out “Ping Jun.” Yun Ge stopped and shrank into the shadows. A tall handsome young man walked up. His black robe was washed so much it was turning white, his shoes were covered in patches, and he was carrying a few chickens that barely had any feathers left on them. Even though his attire was so poor, he didn’t exhibit the demeanor of a poor person. The way he walked was as purposeful as a lion, his eyes showing a kind of lofty coldness. But his smile was open and carefree, revealing a contentment borne from being an ordinary person. Nobility, poverty, coldness, warmth, all of these incongruous auras combined together in this young man. Yun Ge angrily looked towards him and then her heart leapt. Even though his demeanor was not the same, but those eyes……so familiar! The man laughed heartily and didn’t resist anymore, taking the money and putting it in his robe. He took the carrying stick from Ping Jun and they walked side by side down the lane. Yun Ge’s mind was in a daze. That jade piece? That jade piece! Under the sunlight the dancing dragon was the identical as before. Yun Ge grabbed a piece of raw ginger in her pouch and smeared it over her eyes. It immediately turned red and her tears came tumbling down. Yun Ge ran towards them, and the man reacted quickly when he heard the footsteps and turned around but Yun Ge had already ran into Ping Jun. The man grabbed Yun Ge’s arm to berate her, but he saw a beggar with tears so he tamped down what he was going to say. Yun Ge pulled her hand back and looked carefully at his face, before saying “I’m sorry” quickly to Ping Jun and then stumbling away. Ping Jun had been hit right on her chest and she was red faced with anger, but when she saw Yun Ge’s face, her temper disappeared and she asked “Little brother, who mistreated you?” But before her question was finished Yun Ge had already disappeared. Yun Ge sat under a tree and stared in a daze at her jade piece. A few hours passed and she never moved. She had been worried about how to find him without the hair rope, who knew she set foot in the city and would immediately run into Ling gege. A person’s looks will change, but the jade piece wouldn’t change. This one was identical to the one Ling gege wore. Unless a jade came from the same piece and from the same artisan, it was impossible to make two identical ones. Plus he had the same eyes as she remembered. 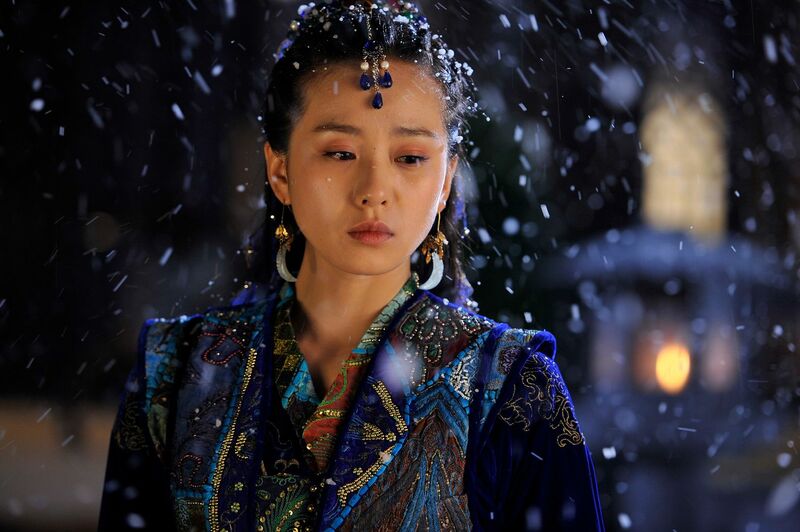 Before she arrived in Chang An, she worried she wouldn’t find him or he had left, she couldn’t have imagined that he would have forgotten her. Now she no longer could count on Ling gege remembering their promise, which was thousands of days ago. Back then he wouldn’t give her the jade piece, yet now it was in the hands of another girl. Yun Ge sat there until her stomach growled, remainding her that she had gone to Qi Li Xiang to eat. But after all that, she simply forgot. She dragged herself to a random noodle store to just eat something. The owner look measure of Yun Ge’s get up and was disgruntled, but Yun Ge was so preoccupied she didn’t care to play tricks anymore and just tossed him extra money for the meal. The owner immediately changed his attitude and brought whatever she ordered. The noodle was just average, and Yun Ge was hungry, but she wasn’t able to eat it. She lowered her head and started counting each strand, when suddenly the chatter in the noodle store all faded into silence. Yun Ge looked up and startled, a richly dressed man was standing at the doorway and taking off his hat. A simple move, but his movement was alluring and elegant so the viewer simply couldn’t look away. His hair was encircled with a white jade circlet, his black strands darker than the darkest night, seemingly softer than the smoothest silk, shinier than even precious gems. It was hard to differentiate from his features whether he was Han or Xi Yu, his angles were sharper than the Han, but softer than a Xi Yu person. He was as perfect as if carved from a piece of jade. A personage like him ought to be stepping on jade stones with a beauty on his arm and living in a crystal palace, yet he showed up here and was warm and polite to the owner. He asked for a bowl of noodles. Because of his appearance, everyone stopped eating and just stared at him. Some people felt overwhelmed and wanted to leave but couldn’t. 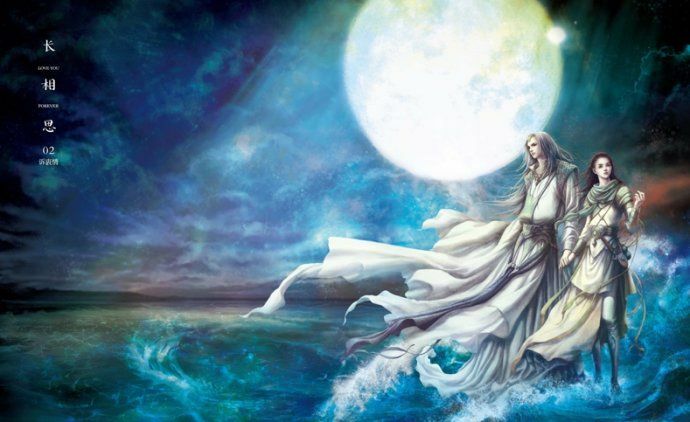 Yun Ge had seen plenty of lofty personages with powerful auras, but this person was as calm as the moon’s reflection on a lake, as light as the high clouds, as warm as a Spring breeze, as clean as a tree on the banks. Yun Ge thought of a lot of descriptions but couldn’t find one suitable for him. He gave off the impression that initially felt very clear, but it was as ephemeral as a passing cloud or a flowing stream, clear but impossible to capture. Someone like him really is hard to encounter in life. The man saw Yun Ge staring at his eyes, and there was flash in its obsidian depths. Yun Ge might have been secretly admiring his form, but since she was small she traveled the world with her parents and saw countless interesting people and things. The reason she kept staring at him was because she felt this odd tinge in her heart. It was like when one is traveling and comes across a new vista. You know you have never seen it before, but there is this indescribable feeling of familiarity almost like you encountered it in a dream. Yun Ge thought about it but couldn’t make any connection, so she shrugged it off and went back to counting her noodles. The young man asked Yun Ge with a smile “Can I sit here?” Yun Ge looked around and saw there were no empty tables, but he still didn’t need to pick her to share a table with. There was a pretty older woman staring at him, he could sit with her, why pick someone as dirty as her? “When one is being stared at while eating, even the most delicious food loses it allure” the man said with some resignation and continued to smile like a March sun. Yun Ge was dressed like a beggar this whole way and always people avoided her. For the first time someone was talking to her as if she was dressed in her normal outfit. Yun Ge felt a sense of warmth towards him and nodded her head. The young man made a gesture of thanks and sat across from her. Everyone stared at her and Yun Ge immediately regretted agreeing to let him share her table. But it was too late for regrets, might as well endure it! The owner brought over a bowl of noodles in a fancy bowl, with more meat, better meat, and more noodles than hers. It smelled so fragrant that Yun Ge knew it was much better than the one she was eating. Yun Ge sighed loudly. This is the power of beauty. It’s not only beautiful women who get special perks, even a beautiful man also gets this treatment. Meng Jue ate a bite of noodle and nodded with a smile, like he was really tasting the noodle. Yun Ge softly sighed, how could this person’s noodle eating gesture still be that beautiful? 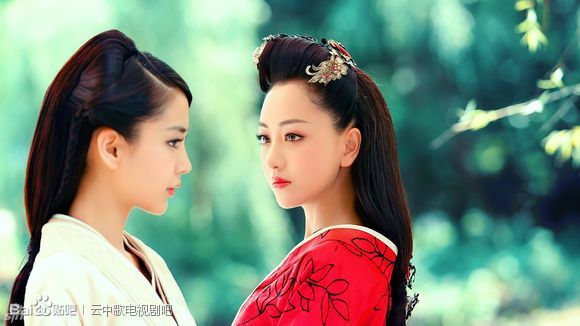 Yun Ge stared at Meng Jue in a daze, her hand playing with the jade in her pocket. Her purpose coming to Chang An was to find Ling gege. Now that she found him, what’s next? Meng Jue looked at Yun Ge seemingly staring at him, but not seeing him at all in truth. His eyes flashed a bit of annoyance with a dash of heavy concern, and then it was gone in the blink of an eye, returing to a Spring breeze type of warm smile. Yun Ge’s face turned red, thinking Meng Jue was talking about her, thankful her face was covered in dirt. She threw some money at the owner “Enough?” and the owner smiled “Enough, enough!” Meng Jue just had a smile when watching Yun Ge pay for him and didn’t decline. Yun Ge noticed two people ahead and wanted to slip away, but suddenly Meng Jue grabbed her and kept profusely thanking her. Yun Ge tried to break free but couldn’t. Meng Jue was already so eye-catching, and now he was pulling and pushing with a beggar, so everyone on the street turned to watch. Xu Ping Jun and Liu Bing Yi, walking ahead, also turned back and when they both saw Yun Ge they rushed over. Xu Ping Jun yelled “You stinky beggar, return what you stole or else you’ll get it!” Everyone on the street stared at Yun Ge and Meng Jue made a shocked expression before releasing her. “Give it back!” Xu Ping Jun reached out her hand to Yun Ge and said with a very angry tone. Yun Ge bit her lips and hesitated, before slowly taking out the jade and handing it over. Xu Ping Jun wanted to take it but Yun Ge appeared to be reluctant and couldn’t let go right away. Xu Ping Jun pulled hard before taking it back. She saw everyone watching them and remembered Liu Bing Yi’s admonition that this jade could not be seen by outsiders. She quickly put it away but touched it to make sure it was fine before letting out a sigh of relief. “You’re so young but you’ve got skills and endurance. You can make your way, so why aren’t you learning proper things and doing these bad things?” Xu Ping Jun wanted to sternly scold this beggar who stole from her and touched her chest, but when she saw the beggar looking completely forlorn with unshed tears in her eyes, she didn’t have the heart to be angry anymore. Liu Bing Yi heard Xu Ping Jun’s initial angry words and smiled with a bit of discomfort. Everyone around knew what Liu Bing Yi did and had to stop themselves from smiling. If comparing who learned to do the most bad things, no one on the outskirts of Chang An can beat Liu Bing Yi. Even though he didn’t steal or rob, but those who did were all his friends. He didn’t know how to farm but he knew all the side tricks, so much that even the rich kids in Chang An came to gamble with him. Yun Ge looked at Liu Bing Yi, and then looked at Xu Ping Jun. He’s jade has already been given to someone else, he must’ve forgotten their stories already. The promise they made, the one that neither was allowed to forget, he must’ve have already forgotten. Yun Ge’s lips quivered and she wanted to say something, but when she saw Xu Ping Jun staring at her, her youthful heart couldn’t say it out loud. Forget it! She came to Chang An and she saw him. Since he’s forgotten, just let it be then! Yun Ge silently walked past Liu Bing Yi, still in a daze like she got lost in the middle of an intersection and didn’t know which way to go. “Wait!” Yun Ge’s heart leaped and she turned back towards Liu Bing Yi, who didn’t know why he stopped her. He hesitated and then said in a gentle voice “Don’t steal anymore” and then took money out and gave it to her. Yun Ge smiled but her voice was still crackly “Thank you for helping me. I’m very happy, but I don’t need your money.” She stared at the clearly unhappy Xu Ping Jun and then quickly ran off. Liu Bing Yi wanted to call Yun Ge again but saw Xu Ping Jun staring at him, so he just turned back and gave her an apologetic smile. Xu Ping Jun glared at him and then stalked off. Liu Bing Yi quickly chased after her. When he passed Meng Jue, the two of them gave each other an assessing look and a mutual smile. One person’s smile was dashing and confident, the other gentle and warm. The people on the street dispersed now that the show was over. Meng Jue stood there not moving, staring at the direction Yun Ge took off with a slight smile on his face. The sunset pulled his shadow out until it was very long. Even though the street was crowded with people, for some reason everyone automatically gave him lots of space. Yun Ge walked for a long time down the street. It was dark out and she didn’t know where she was headed, but she couldn’t keep walking. A servant at an inn was calling out for guests to stay there and Yun Ge stopped. He wanted to send her out back if she was begging for food. Yun Ge reached inside and found no money. At home she never knew the importance of money. But on this trip, she understood that even a hero can be forced to die without money. She started to get nervous and searched her entire body, but her money purse and accessories were all gone, even her pouch containing her spices was gone. The warm water washed away all her dust and dirt, but couldn’t wash away her emotional emptiness. She laid on the pallet for a long time but couldn’t fall asleep. She heard a familiar tune coming from outside, causing her heart to flutter and she quickly put on her robe and went outside. On this trip, she dressed like a boy for fun and not purposely to hide her gender. All she did when she left was tie her hair back and took off. Meng Jue, wearing all white, was sitting in a bamboo pavilion and playing the zither, his long hair beautifully falling around him. This image led Yun Ge to think of a poem she once read, which would be perfect in describing Meng Jue. Meng Jue heard Yun Ge’s footsteps and raised his head. It was like the moonlight came down with his gaze, shining its light on the entire courtyard. He didn’t blink an eye at Yun Ge’s female attire, barely glancing over her before returning his eyes to the zither. Yun Ge didn’t even bother to explain and just quietly sat down on a rock. This song she listened to since she was small, it helped to ease her emotional exhaustion a bit. After the tune finished, neither spoke for a long time. “You must find it strange then, why would I steal something if I wasn’t a thief? My Second Brother has a good friend Swifty Hands. He’s a good person, and to be able to eat my food, he taught me his pickpocketing skills. He boasted that if he was the second best in the world, then no one could be deemed the best. But my money got stolen today and I never once noticed. In the future when I see him, I’ll laugh and say he’s wrong, someone else is better than him!” Yun Ge started laughing as she talked. Meng Jue’s lowered eyes flashed a thought but he was still smiling. He lightly plucked a new notes from the zither and the twinkling notes perfectly paired with Yun Ge’s laughter. “Fine! You wash up and an outfit will be delivered shortly.” Meng Jue’s taste didn’t disappoint Yun Ge. The outfit was exquisite without being flashy, the detailed work was evident, and it happened to be her favorite color. Yun Ge checked herself out in the mirror. A green woven skirt billowing around her, giving her a certain ladylike effect. She made a face at her own reflection and then ran out of the room. “Okay, then….nothing too complicated, something simple!” Yun Ge rattled off these fancy named dishes and then a special wine as a chaser. The waiter looked stricken and could only guess what those dishes were. But since he already proclaimed anything was possible, he quickly excused himself to go find the chef. Before Yun Ge can answer, a clear female voice called out “Isn’t it just a stir fried eel dish? Who has time to make it so complicated. Chang Eh Dancing Moon? Sounds like someone is trying to cause a scene.” Yun Ge looked up and saw Xu Ping Jun walking in while carrying a large barrel of wine. The old chef stared at Meng Jue, wondering why this rich guy needed to let this sparkling little lady earn money for him. Meng Jue saw the disgruntled look but could only smile wanly. Yun Ge smiled brilliantly at Meng Jue “My first guest will be Mr. Meng then, thank you for sampling!” She got up and walked into the kitchen. After some time, the dish hadn’t arrived but the smell did. Everyone turned their noses towards the kitchen. Zhou Gong Spitting Seeds wasn’t placed in an ordinary urn. It was plated in an emptied out winter melon. The waiter purposely walked very slow. The outside of the winter melon was carved with the characters of “Zhou Gong Spitting Seeds, The World Retrieves the Heart”, with the green of the melon as the base and the white of the melon meat as the design. The green and white contrast turned this dish into a work of art. As the dish passed each table, the smell caused everyone to praise it. Another waiter came out holding an all white plat with an eel on it. The eel was plated like a woman dancing with her sleeve billowing in an alluring way. The two waiters announced the names of the two dishes and the other customers all clamored to order it. The owner was beaming and announced that this was a new dish created by the new chef and today there would be no more made. But everyone can come early tomorrow to sample it! From behind Yun Ge came the sound of a woman laughing. Likely Xu Ping Jun heard Meng Jue call it the most beautiful meat ball and eel and couldn’t help but laugh. Yun Ge turned to look at Xu Ping Jun, who raised an eyebrow and looked challengingly at Yun Ge. But Yun Ge gave her a breezy smile and turned back to look at the meat ball on Meng Jue’s chopstick and also started laughing out loud. Ms K, you’re so generous to us. first, I know Bu Bu Jing Xin from you..
second, I can read Da Mo Yao because of you..
and now, Yun Zhong Ge.. I believe Du Chun and Qiao Zhenyu are slated for the two male leads, and female lead will be Yuan Shan Shan. Definitely not watching this one. Yumama specifically said the female lead will NOT be YSS. As for Du Chun, that is Tong Hua’s choice but we shall see. If Qiao Zhengyu does Ling gege I might barf but he does have the shu-sheng look. Yu Zheng said he hopes the female lead will be either Zhao Li Ying or Zheng Shuang. I can handle the former but barely tolerate the latter. Honestly, I don’t care who does the drama. I am enjoying my novel imagination freedom. Because of you, Koalas are now my favourite animal! koala..thanks a lot..this is my new crack! Thank you for introducing Chinese novels to us..
That would be interesting since Meng ju is also the adopted son of Jui Ye. Too bad she don’t remember him as the other shoe guy. you can’t expect ms. ockoala to give you spoilers right? And i dont think she’ll hand it over easily anyway. I think that is the same speculation a few of us have. I thought about it, and it seems romantic but at the same time, kinda creepy. If he was the one who asked for her hand in marriage, then 1: he know exactly who she is 2: he know exactly who her parents are 3: he follow her the whole way to Chang’an. And for her parent to accept his offer when they have always rejected the other ones, might suggest that they know he’s Jiu Ye’s adopted son. But then it doesn’t make sense that he’s in the restaurant on the 2nd floor when she just arrived. My guess is that he saw her there, and decided to follow her. I think he’s also the one that stole her money as well. Ohhhhhhhhhhhh….YH! 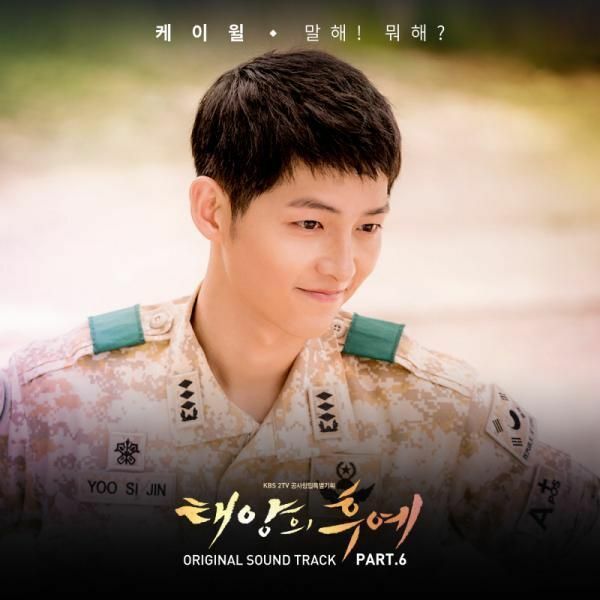 Awww…seeing his picture kinda want me to picture LSS as his leading lady again, lol. Thanks for translating! Koala, you must have 28-hours in your day while the rest of us only have 24. LOL! Thanks for chapter 2 of YZG. Like BBJX and DMY before it, this novel seems like a sweeping epic that requires readers to mull over the chapters to really get a “feel” for each character and scene. Also, thanks for the advice to “read and think and allow the answers to come in due time”. –easier said than done, but I’ll try…. 🙂 Thanks for introducing me (us) to these wonderful writings. I started reading chapter 1 this afternoon and totally got hooked. Yun Ge’s character is so adorable. I already love her. So excited when I see your updated chapter 2…. thank you so much. I will be looking forward for your next installment and hope to read it soon. I dont know what has gotten to me and decided to read chapter 1? And after reading chapter 1, I’ve been craving to read chapter 2, to my surprise my friend told me chapter 2 is out. And now im so dying to read chapter 3. Ms.K, first time reading chinesse novel and im efing loving it. Thanks for introducing me here. Okay back to the story since im new here, im seriously slow. MJ is not Ling gege right? PS: Im excited to meet Ling gege. Love his arrogance and self confidence..
TY Ms. K so so so much…….. The writing is so poetic. Ms K, your so wonderful as novel you’re translating, thank you so much make me enjoy both novel as well. You’re the best. I guessing Meng Jui took her money. 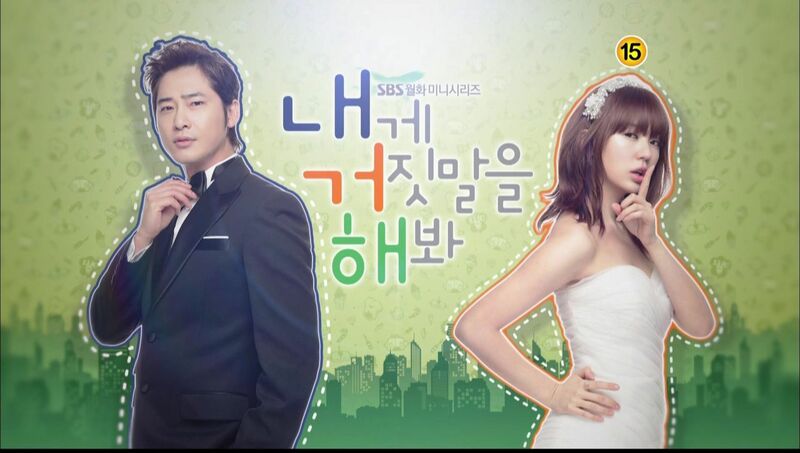 QADFGHFHGKJGHFGFDSADFFHGKHJGHFGFA AND u r giving me my closeted CP I so veryvery want the most in Cdramaland…. May I ask how am I going to sleep uneventfully in near future?!?!?!! 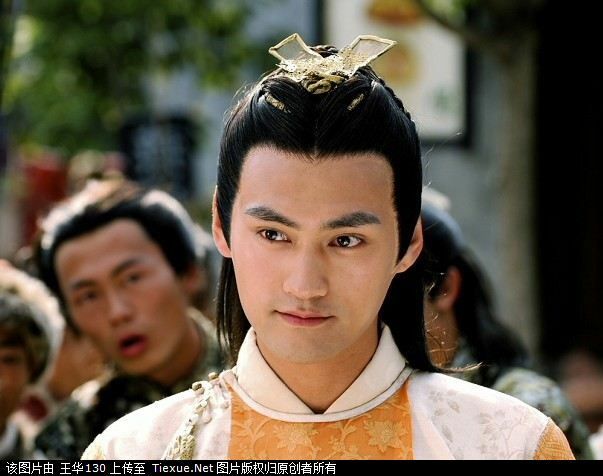 You are tardy snail, I punish you with more Yelu Xie rewatching and then posting hot gifs of him at your LJ. Your closet C-drama CP is HongMi? No way! I shipped them SO HARD in Prince’s Education, esp since leading lady was a wet sponge. Blergh. But they are insanely cute. Mi also had waywayway better chemistry with loverboy in his few episodes CP3 cameo than she did with HuGe. Bless his poor heart. Remember that tiny sequence between Yang Kang and Rong Er in the steel spear temple, and I was like “OMFG, I ship Yang Kang with Huang Rong, what the hell is wrong with me!! !” I feel like when Yuan Hong shows up, he steals all the chemistry with the girls. PERIOD. Wait….or is your secret C-drama CP……HongQiu? Ahahaha, okay, I can totally get onboard that as well. It’s no RedWhite, but it is much too pretty. Hhhmmm, HG and Roy did have good bromancing going in Invincible…. Oh the possibilities. I thought HongMi’s chemistry in PD was out of this world, and this coming from a Qing drama where everyone was standing five feet from each other and never touching. I totally agree: “when Yuan Hong shows up, he steals all the chemistry with the girls.” He’s just so hot, especially in his angsty bad boy roles. Hi Koala, have you ever thought of writing your own novel? You probably have some stories to tell, and I think you’d be good at it. It would require different skills like researching history, but you may find that you have a lot of fun with it. Ahaha, I love reading but writing gives me a headache. I don’t even know why I’m doing this sometimes. No, Xie Yo Qu is not written and at this point I doubt she’ll write it. My instinct tells me she’s moved beyond early Han and to other time periods and genres. If I were to speculate, based on the title of the book alone, I’d say it was about Princess Xie Yo, making it then a prequel to DMY and YZG. Wouldn’t it be great if it about 3rd brother..
from what little part that was about him.. he seem like a really good character to get to know.. Such a conflicted & complex character such as Meng Jue would be really a challenge to be portrayed in a drama.. Would love to see how Yu Zheng attempts to accomplish that feat though I doubt any production can ever do MJ justice! Bingo. Imagine if you will Huang Rong in her beggar get up running away from home cuz daddy yelled at her, and then falling in love with Yang Kang instead of Guo JIng. Oh, the mind boggles. TH’s taking so much inspiration from LoCH and RoCH for her Han novels it’s pretty funny. Oh, don’t forget Yun Ge’s amazing culinary skills. Seriously? Tong Hua, if you wanted to borrow Rong Er, you need to be less obvious than picking the most famous little chef to grace the pages of a wuxia novel. Anyway, back to YZG, if Rong Er was Yun Ge, then the moment she ran into Liu Bing Yi, she would have flat out asked the dude if he was her Ling gege and whether he had her green shoe. Hence, all future crap avoided. I mean, when Rong Er saw Hua Zheng for the first time, she immediately confronted Jing gege and asked him who she was, and what their relationship was. And in front of Hua Zheng, she was all like “Oh no you don’t, the boy is mine”. She only backed off because stupid Jing gege and his stupid integrity. And then she said “I don’t care who he marries, he will always only have me in his heart.” Swoon. Ladies take note – be honest and lout and proud about your man. With Yang Mi as Yun Ge, I hereby present my loverboy Yuan Hong as Meng Jue and my special guy Roy Qiu as Liu Fu Ling. I love the cast you picked! They are prefect especially the boys. Not a fan of Yang Mi but I think she is not too bad. Can we just have them in YZG pleaseeee? I never like reading Chinese novels but just reading your recap on YZG chapter 1, I had to quickly find the Chinese version to read. I cried a buckets yesterday at the end of chapter 2 despite not fully understanding 20% of the text since I don’t really read novels. Such a shame because I can those are really beautiful descriptive words/ poems. So I really hope you can continue to recap this series. It’s a lot a lot of work and I really appreciate it. YZG is totally heart breaking and I think it will be more phenomenal than BBJX if the cast are right. My heart is breaking and I really can’t bare to read Chapter 3. Thanks again koala for this new chapter of Yun Zhong Ge. Wow,in other side was DMY and now this…i’m really curious about 3rd brother..you’re the best ms koala. Now,i will read again,enjoyed and think about it. It was like his father was remembering someone. Is he thinking of Meng Yu after meeting Meng Jue?